Profile: Walter J. Curran, Jr.
2014 has been an exciting year for Walter J. Curran, Jr. He recently marked his fifth anniversary as executive director of Winship Cancer Institute of Emory University. In June, he became the first Emory physician and Georgia-based doctor to hold a seat on the board of the American Society of Clinical Oncology. 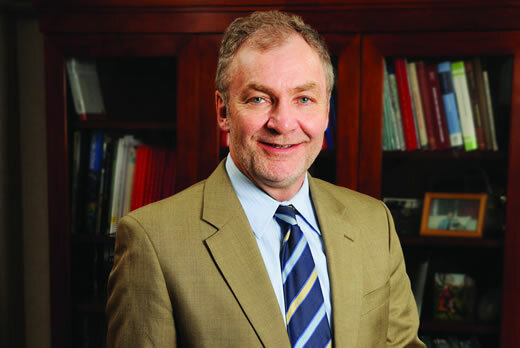 Curran ranks among the top 20 researchers nationwide for National Institutes of Health funding. Q:1 How has Winship Cancer Institute changed since you took the helm in 2009? We've seen so many positive changes in the past five years due to the recruitment, retention, and career development of many outstanding physicians and researchers. We have doubled the number of patients enrolled in clinical trials, and over a third of those patients are participating in Winship physician-led studies. Our hard work paid off this year when Winship was selected as one of 30 U.S. cancer centers to be a lead academic site in the National Cancer Institute's new National Clinical Trials Network. Q:2 What are some of the most promising developments happening in Winship laboratories? Some of our most exciting work is in the area of new drug and target discoveries. We're one of only two NCI-designated cancer centers looking at protein-protein interactions in patients with brain tumors and one of several studying how to best target lung cancer mutations. Thanks to our partnership with Georgia Tech, we're also a national leader in creating new diagnostic and therapeutic approaches to cancer. Q:3 What is the most pressing issue in the cancer world? One of the most challenging issues we're facing is in optimizing a personalized approach to cancer diagnosis and treatment. We are just learning how to ask the questions in this realm, let alone how to answer them. Genomics information related to a cancer diagnosis can be overwhelming. We are working with some of the best minds in the world to see how our discoveries in cancer genomics apply to the patients we see every day at Winship. Q:4 You wear a lot of hats at Winship, how do you find time for everything? This type of work energizes me. None of us view these responsibilities as a burden. They are opportunities. If any of us can make a difference, that just gives us more energy. Q:5 What are your goals for the next five years at Winship? It's simple. We want Winship to be the place where groundbreaking cancer discoveries translate into the very best care for patients with cancer.